Area Recreation and Sports: Fitness center on site Seasonal outdoor swimming pool Lake Pueblo Colorado Park Walking Stick Golf Course River rafting Pueblo Palace Ice Arena YMCA- one block- One day membership for hotel guests to enjoy indoor pool, basketball, fitness center and all your activities. Glow In the Dark Minature Golf. The Pueblo Home Show is approaching! Join us in Pueblo, CO on April 12-14, 2019 at The Pueblo Convention Center! See the newest in design trends, remodeling, lifestyle and full home automation. This home show features all of your favorite attractions a home show customarily brings you, with a technical twist! Tour local and national vendors with products and services for your home, garden, and family living. People within every spectrum of special needs and their families are invited to a private photo session, to experience the time-honored tradition of a visit with the Easter Bunny during dedicated hours. Please reserve your complimentary ticket on Eventbrite - ONE TICKET per group or family, please. Celebrating 50 years of Pink Floyd, the Original Laser Spectacular has become a cult classic, presenting the music of Pink Floyd, as you have never seen it before. Surrounded by walls of concert quality sound, Laser Spectacular carries listeners away on a mind-expanding journey driven by cutting-edge effects, high-powered lasers, hi-def. large screen video projection, and special lighting effects. Your senses are confronted with an array of visual displays, choreographed to the soundtrack during this spectacular presentation. Activities : Want to kick back and relax while you're in Pueblo? Looking for some outdoor fun? Maybe you're traveling with a group who is young at heart or a group of little adventurers. No matter what the occasion, we have activities for you! Airport : Pueblo Airport, situated six miles east of Pueblo, Colorado on the dynamic Front Range, is currently expanding its facilities with a new state-of-the-art corporate hangar and 16 custom sites to be built in three phases. Attractions : Whether you are visiting for fun or planning an event in Pueblo, you've made the right choice. Exceptional dining and shopping, first-class facilities, a wonderful art scene, many recreational activities, a wide choice of accommodations and extraordinary service … it's all here in Pueblo. Dining : Pueblo restaurants serve large portions of food. With so much good food, there's bound to be something to please every palate! Golf : Pueblo is proud to say that our golf courses offer more playable days a year than most others in the state. Government : The City of Pueblo has a long and colorful history dating back to 1842, when it was called Fort Pueblo. What brought our city from a small fort in southern Colorado to the backbone of Colorado were the ore mines. This area once housed four separate towns: Pueblo, South Pueblo, Central Pueblo, and Bessemer. These four towns together now make up the City of Pueblo. Hospitals : Founded in 1923, Parkview Medical Center in Pueblo, Colorado, offers general acute healthcare and behavioral health specialty services. Shopping : Whether you're looking for the latest fashions or rare antiques, you'll find it in Colorado. From major shopping districts to exclusive boutiques, brand names to one-of-a-kind creations, Colorado offers great shopping all over the state. University : Colorado State University-Pueblo is nestled in a historically and culturally rich community of more than 100,000 people, located in the southern part of the state near the foothills of the Rocky Mountains—just a short drive to Denver and Colorado Springs. Welcome to our great hotel in Pueblo Colorado with affordable rates and cheap budget discount lodging. Santa Fe Inn welcomes you to our budget hotel in Pueblo Colorado. Santa Fe Inn will provide you excellent customer service with great amenities in comparison to all Hotels and Motels in Pueblo Colorado. Please visit us on your next stay in Pueblo Colorado and let us provide you with 4 star hospiitality for 2 to 3 star budget rates. 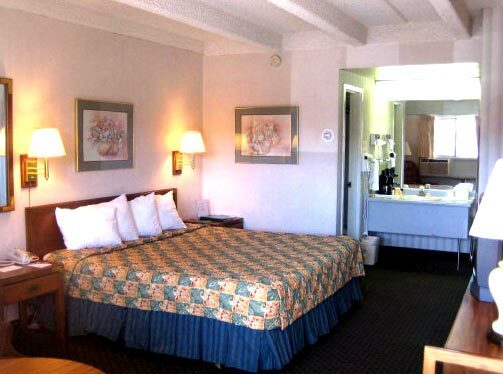 Santa Fe Inn has been providing lodging and accommodations in Pueblo Colorado for sevaral years and looks forward to providing our valued customer and business traveler with the best service in Pueblo Colorado for Hotels and Motels in our local area.